With Halloween fast approaching, the theme and makeup hunt begins. While each year many new costumes and horror inspirations are on the way, the one thing that never goes out of fashion is the vampire! Especially after the long list of Hollywood films and novels that make vampires look all the more exciting and mesmerizing, why not dress up like a smooth looking vampire? If you want to pull off the vampire look, it is quite simple and doable. However, you need to get some things planned out straight before you head to it. Let’s get started! Which kind of vampire look do you need? Ask yourself these questions to pick out the right costume. 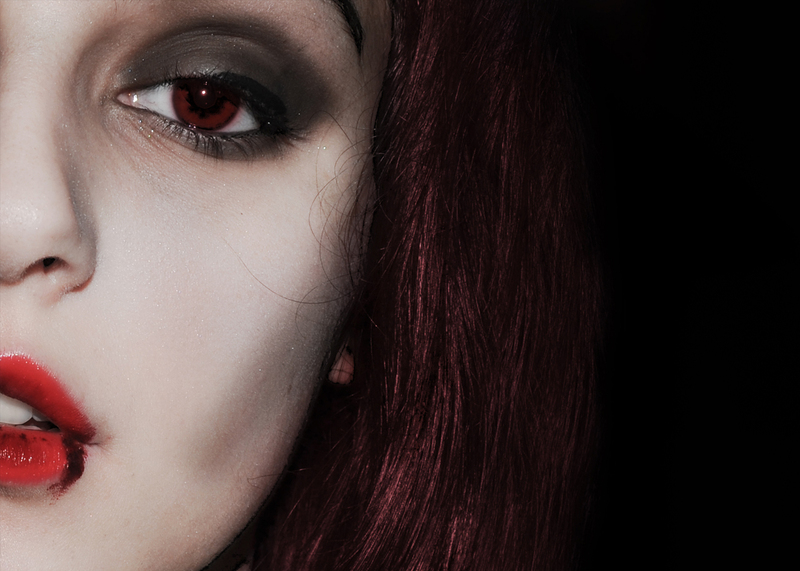 Do you want to be the traditional vampire? If yes, you also would like to add a typical Dracula cape, fangs, and fake blood stains? Are you interested in the modern age vampire like Edward Cullen? If yes, are you satisfied with just the icy cold pale skin and a suit or formal dress? Once you have got these details figured, you can head to make up. The vampire is characterized by the starking white pale skin. Although you don’t want to slather yourself with plain white paint, you still have to achieve the pale look of a vampire. For this, you can choose a very light shade of foundation and setting powder. The lighter the shade, it will make you look paler. If you want the white paint, go ahead with the white paint! But if you don’t want to be very dramatic, a light foundation and compact powder will do. If you are using concealers and highlighters, let them all be light shades. Remember to emphasize more on the cheekbones and jawline to make your face appear hollow. You can also use BB creams of lighter shades. Know more about BB creams here. This needs to be perfect! Yet again, you can decide how dramatic you want it to appear. For the start, concentrate on the eyebrows. Make them dark and thick using a brow liner or eyebrow pencil. Use purple eyeshadow on your eyelids and around the eyes. The circles around your eyes should be visible. Apply black eyeshadow at the beginning of upper eyelid and smear it gently till the end of the eyelid. Apply a coat of red eyeshadow over the back. You can use red on your lower lashline as well. Use light brown, grey or even red eye lenses! Thick eyeliner and mascara will add the best finishing look for your eye makeup. Red. This is the color you need. Either matte or glossy, this again is your preference. Even if you want other colors, you can always do so, but remember to keep the lip shade prominent. Even if you want to keep it natural, make sure it is evident. If your skin is dark, this guide will help you choose. If your dress is for a big Halloween party, go ahead and throw some drama with your fangs and fake blood or red paint! Ready to rock your vampire look? You can add light shades of foundation and powder to other exposed areas of skin to go completely authentic. Dress up and have a wild Halloween (or just another day in the vampire diaries! ).